Now Improved! Better sticking power, and is softer! Like OrthoDots®? Here's a bulk box of 48, to ensure that you'll always have them to protect your mouth from braces pain and discomfort! For a smaller starter pack, see the OrthoDots Starter Pack of 12. OrthoDots are thick individual dots of dental silicone combined with new moisture-activated technology. Unlike traditional dental silicone, your orthodontic braces brackets don’t need to be dry for OrthoDots to stick. Just push them firmly onto the braces brackets that are irritating your mouth. The moisture on your brackets activates the patented adhesive, holding the OrthoDots in place for hours (6 to 8 hours or more). You can even eat and drink with them on! Works for all types of braces: metal, ceramic, lingual (behind the teeth) and even Invisalign and Invisalign attachments. Protects the back of your cheeks from poking wires better than wax. Plus, they're made in the USA! OrthoDots are made of biomedical grade silicone, which is 30 times stronger and more pliable than regular dental wax. * This makes them extremely moldable and easy to apply and use. You can wear them up to 24 hours if necessary, including during meals. They will stay on during light teeth brushing, but take them off for your daily heavy brushing or strong water flossing. Please note that they are not re-usable (will not re-stick) once they are removed. Unlike regular dental wax, OrthoDots won’t crumble off, and has superior holding power. Each OrthoDot is individually packaged, making it a more hygienic and portable alternative than regular dental wax or regular dental silicone. Don’t worry if you happen to swallow one -- OrthoDots are non-toxic. Orthodontists love this new product, and in trials they said that they prefer it over traditional dental wax and dental silicone. Each box of OrthoDots comes in either a starter pack of 12 or a bulk pack of 48. Buy a few boxes to keep in your backpack, desk, car, or purse so that you'll never have to suffer from the irritation of orthodontic brackets. Makes a thoughtful gift for a loved one in orthodontic braces! Remove OrthoDots® from packaging. The side that is visible through the package has the moisture-activated adhesive. Press and pinch only this side to the bracket or appliance that is causing pain. OrthoDots® are safe to use while eating and drinking. Non-toxic if swallowed. *Based on tensile testing per ASTM D412 guidance compared to GUM® Ortho Wax. OrthoDots are an exciting new innovation in orthodontic pain solutions! 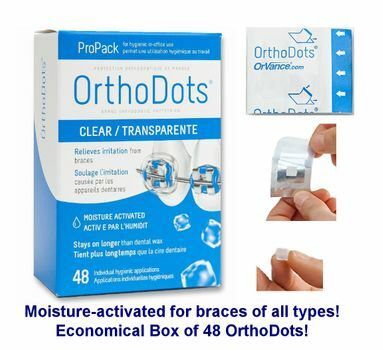 We love that OrthoDots will stick to your braces brackets when they are wet! In fact, they are made especially to stick when your braces are wet! They're like tiny mouthguards if you sleep on your stomach and have a certain bracket or wire bothering you. just cover it with gel, problem solved. if you're trying to eat without pain I'd put them on about an hour before you eat or wait til after bc they do sometimes come off while eating. they usually stay for two days. love these things.